NO PURCHASE NECESSARY. Contest begins October 1, 2008, and ends April 30, 2009. Enter by printing your name, date of birth, parent’s/guardian’s name if under the age of 18, full address, and phone number on an 8½ x 11 piece of paper or via e-mail and in 200 words of fewer let us know “Who’s Your Fairy”. 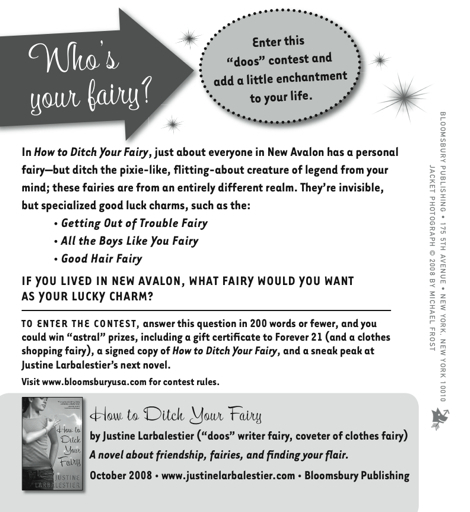 Mail to: How to Ditch Your Fairy Contest, Bloomsbury Children’s Books, 175 Fifth Avenue, New York, NY 10010 or e-mail to children.publicity@bloomsburyusa.com. Entries must be received by Bloomsbury no later than April 30, 2009. Partially completed or illegible entries will not be accepted. Sponsor will not be responsible for lost, late, mutilated, illegible, stolen, incomplete or misdirected entries, or entries with postage due. All entries become the property of Bloomsbury and will not be returned, so please keep a copy for your records. Contest is open to legal residents of the United States and Canada (excluding Quebec, Puerto Rico, Guam, the U.S. Virgin Islands, and where prohibited by law) to persons over eight (8) years of age. All federal, state, and local laws and regulations apply. Void wherever prohibited or restricted by law. Employees (and employees’ immediate family and household members) of Sponsor, and its parent, affiliates, subsidiaries, suppliers, printers, distributors, advertising and promotional agencies, and prize suppliers, are not eligible to participate in the Contest. There will be one (1) Grand-Prize winner selected and two (2) Second-Prize winners selected. One Grand-Prize winner will receive a phone call from Justine Larbalestier, a signed copy of her book, a $150 gift certificate to Forever 21, and a sneak peak at Justine’s next book. Total approximate retail value of Grand Prize: $500.00 U.S. Two (2) Second-Prize winners will each receive a signed copy of How to Ditch Your Fairy, a $50 gift certificate to Forever 21, and a sneak peak at Justine’s next book. Total approximate retail value of Second Prize: $200.00 U.S. No prize substitution except by Sponsor due to unavailability. All eligible entries received by the end of the contest closing date will be judged by Justine Larbalestier and the Bloomsbury Marketing Department. All entries submitted in accordance with the submission guidelines contained in these Official Rules will be judged on the basis of creativity, clarity of presentation, and uniqueness of style. Winners will be notified by phone or e-mail on or about May 31, 2009. Any winner notification not responded to or returned as undeliverable may result in prize forfeiture and an alternate winner shall be selected. The potential prize winner and, if the potential prize winner is under the age of 18, the potential prize winner’s parent or guardian will be required to sign and return an affidavit of eligibility and release of liability within fourteen (14) days of notification. In the event of noncompliance within this time period or if the prize is returned, refused, or returned as undeliverable, then an additional judging from eligible entries will be made to determine an alternate winner. No substitution or transfer of a prize is permitted except by Sponsor. By participating, Winner (and if under the age of 18, Winner’s parent/legal guardian) agrees that Bloomsbury and its parent companies, assigns, subsidiaries or affiliates, advertising, promotion, fulfillment agencies, and suppliers will have no liability whatsoever, and will be held harmless by Winner (and Winner’s parent/legal guardian) for any liability for any injuries, losses, or damages of any kind to person, including death, and property resulting in whole or in part, directly or indirectly, from the acceptance, possession, misuse, or use of the prize, or participation in the contest. By entering the contest, Winner (and if under the age of 18, Winner’s parent or legal guardian) consents to the use of Winner’s name, likeness, and biographical data for publicity and promotional purposes on behalf of Bloomsbury, with no additional compensation or further permission (except where prohibited by law). For the names of the winners, available after May 31, 2009, please send a stamped, self-addressed envelope to: Bloomsbury Children’s Books, How to Ditch Your Fairy Contest Winners, 175 Fifth Avenue, New York, NY 10010. Good luck! And do tell all your friends, family, and anyone you know who might be interested. Feel free to link to this far and wide. Posted in How To Ditch Your Fairy.